Back in January, one of my blogging resolutions was to reinvigorate my Sunday Supper posts and get back to posting them regularly on the second Sunday of each month! I'm happy to say that, at least for January and February, I'm sticking to my goal! 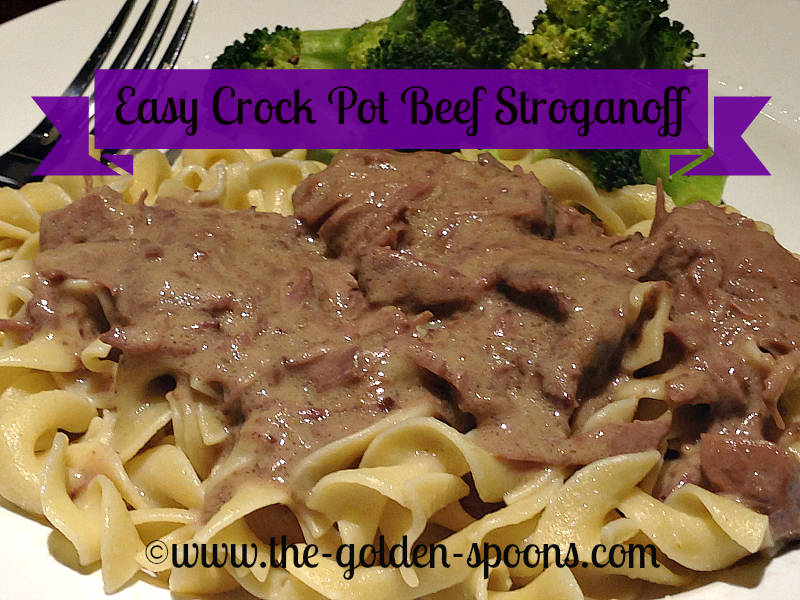 Today, I'm sharing a super easy, super yummy crock pot beef stroganoff recipe. Like it or not, there is still a good bit of winter weather ahead of us and this is a great meal to have on a cold evening. It is comfort food for sure! It is also a one you can throw in the crock pot early in the day and, at dinnertime, it's ready for you!! Hope you enjoy it! Toss your meat into the crock pot. In a bowl, mix together the soups, broth, and Worcestershire. Pour mixture over the beef and cook on low for 6-8 hours (or high for 4 hours). Just before serving, boil the noodles according to package directions and stir sour cream into crock pot. Serve by spooning the beef over the prepared noodles. Add a salad or some steamed broccoli and dinner is DONE! Yum! Making me hungry, Lisa! Boy do I love beef and noodles in the crockpot. Mm.. Perfect for a snowy day like today. Although I hear it's not so cold and snowy down there? We love strogonoff! I'll have to try this one soon!! Yay! I love this one because it is so easy to throw in the crock pot and forget it. Yummy! Perfect for a cold winter night! Looks so good! Pinning to try one of these days!